Sheona White was born in Maybole, Ayrshire in Scotland and began to play the tenor horn at the age of ten. Sheona showed a prodigious talent at an early age, becoming the "Junior National Solo Champion of Scotland" and was appointed Principal Horn of the National Youth Brass Band of Scotland. Between 1992 and 1996, Sheona studied at the University of Salford. As principal horn with the University band, she toured Ecuador and Brazil and graduated with a distinction in performance. 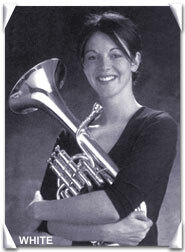 In 1994, Sheona won the British Open Solo Championships and subsequently represented Great Britain in the "International Brass Musician of the Year" competition in Auckland, New Zealand. Sheona has been Principal Horn for over five years with the Yorkshire Building Society Band, a winner of the European, All England Masters Championship. In 1996, Sheona won the coveted title "BBC Radio 2 Young Musician of The Year" and subsequently made her London debut with the BBC Concert Orchestra at the Queen Elizabeth Hall. She has since made numerous broadcasts and frequently appears as guest soloist and tutor with brass bands world wide. Sheona was selected as a finalist in the Cosmopolitan Achievement Awards and was presented with a platinum disc for her part in the worldly acclaimed Perfect Day C.D. Sheona's professional appointments now include the post of tenor horn tutor at the University of Salford and International Endorsee and consultant for Boosey & Hawkes Ltd.
Click on the following link for more about Sheona White and her position on the faculty of Avalon Brass Band and Percussion Camp. See also this recording by Sheona White, The Voice of the Tenor Horn. and a performance photo.